Added support for Rack Extension SDK 2.5. Rack Extensions now support sample loading, hidable widgets and more. Reason Patch Collection now includes all patches from Electromechanical and the office favorite patch Bass One’o’One (Reason only). The patch Rheem GlitterTop is now correctly categorized as Electric Piano (Reason only). Fixed a bug where a sample from the Factory Sound Bank could be self-contained which would lead to issues. Fixed an issue where notes could hang when using Players with the External MIDI Instrument (Reason only). Reason 9 also now includes the popular Pulsar dual channel LFO—previously available as a Rack Extension ($49) via the Propellerhead shop. Use Pulsar to introduce variation to your sounds, create entirely new ones using its advanced and flexible modulation, or load up any of the masterfully crafted presets for instant inspiration. Explore creative reverb sounds with RV7000 mkII! The new version of Reason’s cornerstone reverb effect turns RV7000 into a fully featured convolution reverb. Load any of the supplied impulse responses or create your own otherworldly reverb effects by sampling or loading your own impulse responses. Call up Reason’s browser from where you work! The new browser introduced in Reason 8 offers a vastly improved workflow, but was previously only accessible from the main window. After feedback from users who use Reason with the rack in a detached window, you can now access the browser from there as well. Move quickly from birds-eye view to close-up. Hit the Z key to zoom to your selection and hit Z again to zoom back out. This is a real time-saver when editing and arranging! Some Reason users spend most of their creative work in the rack view. Now you can select what device receives your master MIDI controller input directly from the rack, without having to go to the sequencer. Reason will now automatically detect if there is a newer version available, and optionally download and install this. A typical Reason update (without soundbanks) is now around 100 MB - a tenth of its old size! If sound banks (Factory Sound Bank, Orkester and the content bank for ID8) are missing when Reason is launched, the program will now offer to download and install them. Sound banks are now located in a global folder, which means new Reason updates can continue using the same sound banks without having them replaced or copied. It also means that different, parallel Reason installations can share the same sound banks. Reason and Authorizer no longer includes the Codemeter driver. Reason will run with Internet Verification (or in Demo Mode) without Codemeter. Codemeter can be downloaded separately for new users, should they need to run Reason without internet access. When browsing patches, you can now Revert back to the patch that was loaded when you started browsing. The color palette for tracks, channels and clips has been extended to 32 colors. The remotable items for Redrum have been extended to allow programming of Redrum patterns from a control surface. Reinstated key command for Show/Hide Recording Meter: Command-F3 (Mac) or Ctrl-F3 (Windows). Reason comes with a version of Authorizer that support Rack Extensions larger than 2GB. Help files and documentation are no longer installed with the program, but accessed online. Removed 32-bit support. Version 8.2 is a 64-bit application only. Added updated Remote files for Livid Instruments. Fixed a memory allocation bug in Reason Essentials that could cause glitches under some circumstances. Fixed a bug where Authorizer misbehaved if initial installation duties failed. Keyboard focus is now returned to the sequencer after the user makes settings in the Transport panel. Fixed potential crash bug when scrolling time position during recording. Fixed a bug where Reason would assert when adjusting clip length during recording. Updated Drop to Propellerhead icon. Fixed a bug where Reason would assert if setting tempo / position to very high values. Browse focus would be lost when adjusting any parameter on the browsed device, if it was inside a mixer channel Insert FX container. Fixed a bug where Loop on/off wasn’t properly mirrored in both applications when Reason was ReWired. Fixed a bug where Reason couldn’t start if there was a broken Rack Extension. Fixed a bug where Reason could crash if the user didn’t have proper access rights to some folders. Improved track pad scrolling in the sequencer. Reason 8 introduces a redesigned user interface, fresh new look and even smoother creative flow. Quickly and easily access your sounds, loops and patches whenever you need them using a new browser and search window—a one-stop-shop for creative inspiration. Dial-in incredible guitar and bass tones with a collection of new amps from legendary circuit modeler Softube—simply plug in your instrument, crank up the volume and experience the uncompromising tone, response and dynamics of the world’s finest classic amplifiers. Reason 8 also features countless usability improvements that put the flow back in workflow. Drag-and-drop from anywhere to anything and work faster with fewer clicks. 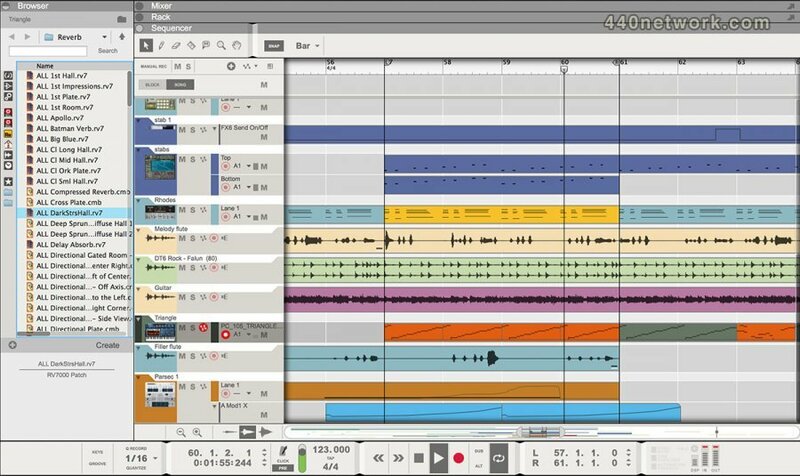 Edit your tracks quickly with more powerful sequence note editing. Reason 8 lets you flow seamlessly from initial idea to completed song. And, with an ever-expanding selection of Rack Extension plug-ins available in the Propellerhead shop, you can easily expand your rack to include everything your music needs—now and in the future. Fixed a problem where moving cables and rack devices could cause extremely slow rendering on some computers. Fixed a bug where previewing certain WAV files in 32-bit floating point format could cause a crash. Fixed a bug where arpeggiators in some Rack Extensions would get out of sync with the main Reason sequencer. Attempting to download a huge number of Rack Extensions at the same time will no longer cause Authorizer to crash. The asterisk indicating subtick lengths and positions is now always shown properly in the Clip Inspector. Loading samples without root key info would sometimes cause root key to be set to the lowest possible key. It’s now properly set to C3. A couple of internal fixes that could cause problems in some cases. Added support for Akai MPK 225-261 controllers. Added and extended support for several Livid Instruments controllers. Support for Custom Displays in Rack Extensions (SDK v.2). Rack Extensions built with SDK v.2 will perform math functions faster. Improved MIDI Clock Sync, with new settings. Reason can now send error reports and usage statistics. Shift-dragging devices will now re-route them properly. Better indications on audio clips. Reason can now import WAV files in 32 bit float format. Slices in self-contained REX files can now be used as samples. A Spectrum EQ button has been added to the Master Section device in the rack. It’s now possible to use the Razor tool on open audio clips. Split at Slices with a huge amount of slices selected will no longer make Reason freeze. A great number of minor bugs fixed! Fixed a bug that could lead to an “Unexpected Exception” message when starting Reason under certain conditions. Fixed a bug where the spectrum EQ window did not function properly after sample rate changes. Fixed a bug where Reason could crash under certain conditions after changing display settings on Mac. Added Remote codec for Novation Launchkey. Fixed Rack Extension download time-out problem in Authorizer. Fixed a problem in Authorizer where an “Internal Error” dialog could be shown when trying to start a new Rack Extension download if old downloads were still in progress. With Reason 7, users can integrate all their instruments into Reason with MIDI out, automatic audio slicing and audio quantize, and even convert their recordings into REX loops for further creative possibilities in the rack. For mixing, Propellerhead is introducing a spectrum analyzer with visual EQ controls; group and parallel mix channels; and many workflow improvements to help users sound better, easier. To inspire, Reason 7 makes it easier to import audio from users’ music libraries and the web with support for mp3, aac, wma and more. The enhanced Factory Sound Bank comes fully loaded with tons of new loops and drum kits, while the new Audiomatic Retro Transformer effect unit adds a futuristic-vintage sound to any tracks, never more than a mouse-click away. Fixed a problem related to scrollbars under Mac OS 10.8, where the program could crash. Fixed a Create Menu bug, where sometimes the wrong device would be created. Fixed a bug in how the Browser uses the registry under Windows. This could lead to situations where some file types couldn’t be browsed and loaded. The Download All function for Rack Extensions could cause the Authorizer to misbehave or fail. Authorizer now works properly under Windows 8. Reason now works with AMD processors under Windows 8. Fixed Combi patch backwards compatibility that was broken in 6.5.0 and 6.5.1. Default browse locations now work as in Reason 6.0.2. Rack Extensions now respond to sample rate changes in the ReWire host. Dropped support for 22,050 Hz sample rate on playback and export. Fixed crash bug when exporting song containing a placeholder device. Stopping playback now cuts hanging notes in Rack Extension devices. Fixed a bug that caused audio glitches in Neptune’s Live Mode. Fixed resource/memory leak when browsing in locations with lots of items. Fixed a bug in NN-XT when doing Set Root Notes From Pitch Detection. Fixed a bug where bounced samples defaulted to 0% Loop. Authorizer will no longer request downloading of license data when it’s not necessary. Fixed a bug where the Master Section’s Insert FX would be moved when moving a connected device to another position in the rack. Fixed some name label bugs in template songs. Fixed a bug where resetting a Combinator containing more than one selected device caused a crash. Fixed performance issues with Alligator on 32-bit Windows. Fixed a bug where context clicking on mixer parameters did not work if the rear of the rack was in view. Fixed a bug where under specific conditions a Rack Extension could cause a crash. Minor Rack Extension hosting fixes. Propellerhead today released new versions of their award-winning music making platform: Reason 6.5 and Reason Essentials 1.5. New in these versions is the introduction of Rack Extensions—a groundbreaking new technology from Propellerhead that opens up the rack to third parties, enabling developers to create their own instruments and effects for Reason and allowing users to expand their collection of instruments and effects with the Reason devices they want. Viewing the sequencer area by pressing F7 would always reset keyboard focus to the track list, with confusing results. Now the keyboard focus setting is properly remembered. If you changed settings in the Tool window when there was no open song document, the program could crash. The output of the RV-7 "Large Hall" algorithm was in mono. Copy command (Copy to clipboard) could cause an "Unknown Exception" error message. A few remote codecs (including Behringer BCR/BCF, Korg Kontrol49 and mikroKontrol) were not properly replaced when Reason 6 was installed over an existing Reason 5 installation, which made them stop working under Windows 64. Now they are replaced by the new version at installation. Some audio hardware models (that worked fine in Record) stopped working with Reason 6 under Mac OS X. If Reason received MIDI Clock while in ReWire mode, the program could crash. With some HID devices (e.g. Tablet input devices of certain brands) connected, Reason couldn't launch properly. Bounce Mixer Channels would cause Reason to hang if the program was in MIDI Clock Sync mode. Using the Speaker tool repeatedly in the audio editor could occasionally make the program hang. When the scratch disk became full, Reason 6 could crash. On a Mac with a two-monitor setup and the SecondBar tool running, some actions could cause Reason to crash. Loading samples, opening and saving songs could take a very long time in some situations. General performance has been improved in many areas. Remote support for Teenage Engineering OP-1 has been added. In rare cases, the Save and Optimize could destroy the song file. This would happen if the operating system reported a problem to Reason at a bad (very specific) moment during save and optimize. Using the context menu on text fields in the tool window that could cause a crash. If some actions were performed in the browser while the name of a Favorite was being edited, this could cause a crash. Tempo map information embedded in audio files within ReFills couldn't be read properly. Now it can. The program now includes Line 6 TWXY 5.26.0. This allows access to computer authorized Line 6 models in Reason and makes the program compatible with Pod Farm 2.5. Zooming with the scroll wheel has been made smoother. The vertical navigator in the mixer did not reappear correctly (after being automatically hidden). The previous version accidentally included a beta version of ReWire. Now, the deployment version is included instead. Removed some misplaced text from the context menu in mixer (when running the program in French). The fully equipped mixing desk adds a big studio signal chain to all your sound sources. Every audio and instruments track has its own channel strip — the built-in EQ, dynamics and advanced routing will give your music that unmistakable million-dollar console sound. The "radio ready" master bus compressor gives your mixes that extra punch. Pulveriser puts crunchy compression, dirty distortion, a multimode filter and flexible modulation in a single, sound-crunching effect. Alligator is a three band pattern-based gate effect that turns bland pads into rhythmic textures, radically twists your loops, and tweak boring beats into blockrocking breaks. New in the Reason rack is the Neptune pitch correction and voice synth device. Neptune turns your performances into pitch-perfect ones in no time. Simply play your new harmonies on your MIDI keyboard for instant backing vocals. Capture your ideas with a minimum of mouse clicks and menu actions — version 6 introduces unlimited hard disk tracks and rock solid audio recording in Reason. The large Recording Meter overlay lets you tune your guitar and set the levels from across the room. With the virtual guitar and bass PODs® from amp and cab simulation experts Line 6, Inc. you are never short of interesting tones and timbres. As a perfect performance may be less than perfect from scratch, Reason 6 features our swift and easy to use comp editor. Building the ultimate vocal track is as simple as selecting the parts that work and muting the ones that don't. Exit the comp editor and listen to the results; a perfect take containing only the good parts. Want to move your song over to your DAW? In one single click, Reason will export your separate mixer channels as individual audio stems, with or without effects. Need just the effects? No problem. The included Factory Sound Bank has been expanded with thousands of new patches and loops for Reason's instruments, and hundreds of patches for the new Pulveriser, The Echo and Alligator effects. Finding your sound has never been easier. * The handling of bad sound drivers has been improved, lessening the risk of a crash due to faulty drivers. * Added Remote support for M-Audio Oxygen 88. * Added localized help and documentation in German, Japanese and French. Note: The localized help and documentation files are automatically included when Reason or Record are installed from the DVD. When downloading Reason or Record, you need to download and install localized help and documentation separately. * During certain circumstances, if a MIDI control surface was locked to a device and the user deleted any device from that song, the program could crash. This would happen if there was another song open and that song was playing back in the background. * The "Arpeggio Notes to Track" function on the RPG-8 could cause the program to crash if some of the RPG-8 parameters had been automated. * Saving a patch could in rare cases cause the program to crash. This happened if the user loaded a patch from a folder containing a huge number of patches, then moved the patch file to another folder and finally attempted to resave the patch by Alt-clicking the Save Patch button on the device. * In some cases, after copying and pasting a sample-based device from one song to another, the pasted device could refer to the wrong samples if the samples were self-contained. * Cable drawing has been slightly improved. * Thor's step sequencer in random mode triggered two voices. This could happen when the "Step" run mode was selected and the direction was set to "Random". * The program will occasionally check the available hard disk space. On some systems, these checks could make the user interface temporarily unresponsive. * Duplicating devices a large number of times could cause a graphical bug in the rack. * A number of localized (translated) text strings were cut off. * Voice handling for the NN-XT has been optimized slightly. * Dr. OctoRex slice numbers were not shown correctly in Edit mode when using the application in German. * If a song used SoundFonts under Windows Vista or Windows 7, the program could store the wrong path to the referenced samples. As a result, there would be missing sounds next time the song was opened. * Switching from MIDI sync to internal sync could result in an "Unknown Exception" alert. * The program could become very unresponsive when working with songs with a large number of self-contained samples. * Songs or combi patches could load with incorrect settings. This happened if a Combi rotary or button had been programmed to control a certain device parameter, and this parameter had been changed "manually" so that its state conflicted with the Combi rotary/button. After saving and loading, the setting of the device parameter was reset to match the Combi settings. * When stopping after recording in ReWire mode, the program could freeze for a few seconds. * Updated some Japanese translations. * The program could assert when changing to virtual MIDI input settings. * Kong's Nurse Rex in Slice Trig mode within a Mute Group would not mute the voice when another pad was triggered. * A crash could be caused by dragging one or more half width devices and hovering over a Disk Channel device that doesn't show inserts. * The function of bouncing several audio clips to new samples or to a new recording could take longer than expected. * The remote override mode was not completely blocked while the program tried to quit. * Muted audio clips in Blocks while adjusting the Block Clip offset could look a bit peculiar. * Sample Editor now handles samples with a sampling frequency below 8000 HZ correctly. * Names of Mix Channels could become blank in certain cases. * Bug in the Mix/Disk-channel, which could occur whenever a device was added or removed in the combi of a channel device (insert effects). This bug might show itself by some short clicking sound, artifact or short freeze when adding or removing devices in a channel device. The Combinator was not affected, and also not the master section. * There was a bug when the user tried to move the notes that were being recorded either by scaling the tempo in the tool window or nudging them with Ctrl-left/right. * Handling of ReGrooved blocks has been improved. * NN-Nano now uses High Quality Interpolation when pitching samples. * Converting pattern automation to notes disregarded pattern offsets incorrectly. * Automation of aftertouch, expression and breath are now smoothed in Thor. Analog synthesis, physical modeling, sampling, REX loops, support sound generators, effects, flexible routing, multiple hit types and more. The Kong Drum Designer is not your regular drum module. It's the drum module focused on letting you get exactly that drum sound you're after. Kong has 16 pads and 16 drums. Build your drum sounds based on any of the nine different drum modules. Flavor the sound with 11 support generators and effects. Program automation, create alternating groups and let Reason's powerful sequencer control the beat. Reason 5 ships with a sound bank with a generous supply of kits for Kong across a wide variety of styles. Remember the time when samples were something you sampled and not loaded from your hard drive? When a sampler was a machine that could record samples, not just play them back. As samplers became software instead of machines, they came to rely on external sample editing software for recording and editing the samples and the art of spur-of-the-moment creative sampling was pretty much lost. Now we are bringing it back to Reason 5 with its live sampling input. All sample players in Reason are now samplers. Just hook up a sound source to the rack's sampling input and you are ready to start sampling. Use a mic, a turntable, an instrument or the entire Reason mix. Sampling in Reason is simple and straightforward. Hit the sample button and Reason starts sampling. Reason will detect the sample start automatically. You can sample when Reason is running too if you like - no need to stop the music. If needed, bring up the built-in sample editor to set start and end points, loop points and more. This is possible for all loaded samples by the way - not only the ones you have sampled. As always, Reason lets you focus on music making - and sampling in this case. All samples are neatly stored in our song file and accessible in the new samples pane in the tool window. Here you can easily see what samples are loaded into what machine and delete and export samples as you wish. Live sampling together with pitch detection of root key and automatic zone mapping makes it dead easy to sample an instrument and map the samples across the keyboard. This way you'll create your own multi-sampled instruments for NN-XT and NN-19 in an instant. Getting a vocal performance right means so much more than hitting the right notes at the right time. Sometimes you get that almost perfect performance with perfect feel and presence, but the singer might have missed a few notes. That's when Neptune can save the day. Neptune is an advanced pitch adjuster, audio transposer and voice synth for Record 1.5. Many musicians tend to think of music in terms like intro, verse, chorus, breakdown, buildup and so on. With the new Blocks mode in Reason 5 and Record 1.5, your sequencer does too. Blocks lets you sequence your songs using a more pattern-based approach, with the segments of your song as individual building blocks to be laid out in your arrangement. Start by creating the discrete parts of your song in blocks mode. When you are ready to start building your song, just switch back to song mode and draw in what blocks should play in the dedicated pattern lane. Use one block for the verse and one for the chorus — or build your song around a single 8-bar loop. Blocks provide a very fast way of creating a musical structure for your song. But the options don't end there. With the basic arrangement laid out, you can see the contents of the blocks and create variations and mute individual parts, or add further musical elements in song mode. A typical use for Blocks is to create your backing track in blocks and then use the song mode sequencer to record vocals or instrumental performances. For music based around a single looped section, one repeated block with automation and mutes of individual tracks added in song mode makes arranging a breeze. You never have to commit to using either mode - you are free to move back and forth between Blocks and Song mode, and any changes you make in your Blocks will instantly be manifested in all instances of that Block. Need some tambourine on that chorus? Add it, and there will be tambourine whenever the chorus block is playing. The upgraded Dr. Octo Rex loop player loads eight REX loops into one player and lets you switch between them on the fly. This makes arranging a breeze - load the drum loops into one player, the guitars into another and use the sequencer to select what loop to play in a pattern-like fashion. With eight loops to switch between, the new loop player also comes ready for the experimental minded. Set the player to retrig the loops on the beat, on the bar or on the 16th note. Or program the loops manually like in the original rex player. For each of the eight loops, the new rex player also comes with an expanded set of per-slice settings. Set pan, pitch, filter frequency and level, reverse slices, use multiple outputs, create alternating groups of slices and much more. Make your songs self-contained by embedding samples and even ReFill sounds in your file. Reason 5's self-contained song format makes collaborating with your friends a breeze. Even breezier than before actually. 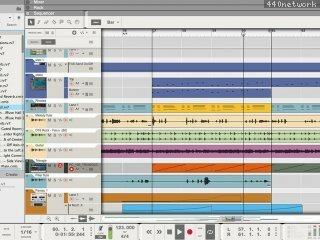 Reason 5 and Record 1.5 lets you use multiple MIDI keyboards, pads, and controllers for playing and recording your instruments. Lock a 16-pad controller to a Kong, and use a keyboard to play your synths. Or use two keyboards on stage for controlling different Reason instruments. By pressing the alt or option key, Record 1.5 lets you timestretch individual clips. Now you can stretch loops to match your song's tempo, or expand samples to eight times the length for completely new sounds. The new Mute tool lets you click to mute and unmute clips. Use it to mute sections, or create variations in your Blocks. Select a clip and press L to immediately set the loop points to the selection. Use the new Remote parameters for real-time control of the loop points from your MIDI controller. New in the transport panel is the Tap Tempo button. Reason 5 and Record 1.5 works even better on your laptop – or any keyboard missing a numeric pad. The new key commands lets you control play, loop, record and more from your keyboard. A sound designer favorite, the Combinator's programmer window is now even easier to use with hierarchical menus for fast patching. The Combinator in Reason 5 is expanded with new CV inputs on the back. The four new CV inputs can be used to control any parameter on the contained devices, providing even more options and possibilities for sound designers. Reason 5 and Record 1.5 comes with a new and better built-in help system, on both Mac and Windows. In Record 1.5 you can normalize and reverse your recorded audio clips. When using Reason & Record, you can now bounce audio recordings to samples, so you can use them in Reason devices such as Kong, Redrum, NN-XT and NN-19. In Reason 5 there are tons of changes to bring Reason up to speed with Record. These changes include advanced multi core support, improved cable management in the rack, faster sample loading, on-screen piano keyboard, sequencer usability improvements and much much more. A maintenance update that resolves a few minor issues and, as a response to user feedback received for Reason version 4, brings some small workflow changing alterations. This is the new Intel Mac compatible version that also packs some serious ReWire performance gains for owners of older macs. The MIDI import functionality in Reason 2.5 accepted some MIDI file data that the Reason sequencer could not handle. This could for example be bad controller data outside the sequencer timeline. Saving this bad data to a song made that song unloadable, causing a "Bad Format" alert. In Reason 3.0 we made MIDI import stricter and also changed song loading so that bad data was skipped instead of showing the alert. Unfortunately there were some problems with this handling, which we have now taken care of. Some songs produced in Reason 2.5 could not be loaded in Reason 3.0 or 3.0.3. We have addressed some issues regarding NNXT patch data created by some patch conversion utilities, where Reason 3.0 is stricter than Reason 2.5 was. There were some situations with cross-browsing (replacing a device by loading a patch of a different device type) that caused "Unknown Exception" alerts in Reason 3.0 and 3.0.3. This has now been fixed. Sending overlapping notes from the sequencer to a Combinator that contained a Malström in Legato mode could cause hanging notes in Reason 3.0 and 3.0.3. For example, drawing two C4 notes where the second note starts before the first ends, and setting the track target to the Combinator produced different results than setting the track target to the Malström. This has now been fixed. After installing Reason 3.0.3 in Mac OS X 10.4 refills icons could change appearance and turn blank. Also all wave and aiff files were wrongly associated to Reason. Both of these issues were a result of new handling of file types in Mac OS X 10.4. This has now been fixed. There was a problem with Keyboard Control in 3.0 that could get Reason to crash, now fixed. Therefore, loading songs produced in 3.0 in version 3.0.3 will clear any Keyboard Control mappings. There were some issues with automating pattern changes in 3.0 that made some songs play back differently than in Reason 2.5. Since we now have fixed this, some songs produced in Reason 3.0 will now play back differently in 3.0.3. The function that triggers the RV7000 Gate via MIDI didn't work at all. If an NN-XT patch references samples with names (or folder names) that include exotic characters, the patch may not load properly in Reason 3.0. This is fixed in 3.0.3. Remote Override mappings for the Dr.REX Preview button were lost when opening a song. This is fixed in 3.0.3. Recording in Replace mode played back the notes being overwritten. This is now fixed. Note that replace recording is only activated for automation data after the automated controller is modified. When playing back an NN-XT patch with Loop activated on the transport bar, the NN-XT could in Reason 3.0 produce a loud transient noise at the loop end position. Fixed. When you automated a Combinator control (button or rotary) and played back the automation in Reason 3.0, there was a tiny delay before the Combinator passed on the information to the devices within it. Fixed. The Resolution parameter on the Redrum and Matrix could not be controlled remotely. Fixed. In Reason 2.5, "Follow Song" was temporarily disabled when you pressed the mouse button. This feature did not work properly in Reason 3.0, but is now fixed. The program was slow to react when the user released the mouse button. This has been addressed and is much better in 3.0.3. This can unfortunately still be noticeable on lower performing computers. For some users with M-Audio Radium keyboards, the Remote implementation doesn't work properly in Reason 3.0. It turns out there are two different Radium models, with different settings in factory preset 1 (just like Oxygen 8). Reason 3.0.3 includes support for both the old and the new Radium models. Several performance and CPU usage issues with Reason 3.0 have been found. There were for example problems with certain settings on the MClass Equalizer, the DLL-1 delay and the Subtractor's noise generator, which could all cause occasional high loads on the CPU. All these issues and many more have been isolated and fixed in 3.0.3. All components of the audio engine and the user interface have gone through extensive profiling which has significantly increased performance of Reason 3.0.3 compared to 3.0. We have also been able to optimize sample loading performance so that loading times for samples have decreased further in Reason 3.0.3. RV7000 Advanced Reverb: A stereo reverb with a multitude of algorithms. Everything from large halls to cool sounding spring reverbs. - BV-512 Digital Vocoder: A 4 to 512-band vocoder with the power to equalize. - Scream 4 Sound Destruction Unit: A behemoth distortion unit capable of every kind of destruction, from subtle tape compression to digital bit-loss mayhem. - UN-16 Unison: A classic chorus-like effect designed to fatten and widen any sound. Fans of classic eighties synths will like this one, only now you can add unison to any sound in the rack! - Spider Audio Merger & Splitter: A small and indespensible utility for audio path scientists. This little box makes advanced routing a lot easier. - Spider CV Merger & Splitter: A handy signal path routing utility for CV and Gate experimentalists that will let you perform tricks that were impossible until now. Just got the demo from this site,excellent stuff,great synthesizers and effects and a nice sample library. J'aimerai une option pour configurer Reason en simple rack d'instrument virtuel. Ni transport, ni séquenceur. Juste un rack de son à connecter en Rewire. La version 3.0.5 est plus "profonde" que la précédente grace au combinator et les banques de sons livrées sont bien plus riches aussi. Je comprend pas je tombe sur une page qui me demande mon pass et mon username, mais je suis déja connecter à mon compte, donc je ne peux pas le telecharger c'est bisarre .... Quelqu'un peux m'aidé ??? Voila ca marche, j'ai simplement pris soins de tout désinstaller et réinstaller :) en résumé : cette version est nickel chrome. Autre amélioration - et de taille : les éléments de mastering de classe M. Une tuerie ! Ne pas hésiter à acheter ce programme car ces Suédois le mérite !!! C vraiman exelan ce site!!!!!!!!!!!!!!!!!!!!!!!!!!!!!! Excellent logiciel remplaceant avantageusement un sampleur et plusieurs synthés virtuels. Très bon complément de Protools 6 en Rewire, il est extrèmement économe en CPU, et très simple d'utilisation. Même les effets sont surprenants.